I had heard so much about Weingut Lutz Müller and the winery's open-air tavern on the banks of the Elbe River which is open during the summer months. We had to go there. It ws a real treat. Weingut Lutz Müller is situated in the vineyards of the Albrechtsberg castle on the hillside with great views of the Elbe river, and Dresden. Castle Albrechtsberg was built for Prince Albrecht of Prussia (1809-1872). The winery Lutz Müller came into being through the passion of Lutz’s parents. They loved wine and as a hobby they started to make wine in Pillnitz. Lutz shared the passion and decided to make it a profession. He studied winemaking at the government owned winery in Radebeul and later gained a lot of experience while working at the Castell winery in the Franken wine region, at wineries in the Mosel and Baden region as well as in California. 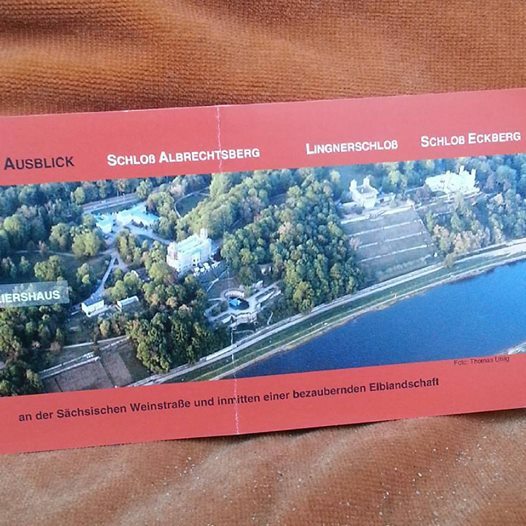 In 2000 he and his parents had the opportunity to renovate the dilapidated Kavaliershaus of Schloss Albrechtsburg and to build a winery. Today parcels in the top vineyard sites „Dresdner Elbhang“ und „Pillnitzer königliche Weinberge“ belong to Lutz Müller. We did not have a chance to visit the winery but had lunch with Lutz Müller in his open-air wine tavern on the banks of the Elbe River. It is a ver basic but very charming place. The wines and food is self-service. Lutz Müller's son offered 6 different wines of Weingut Lutz Müller, all by the glass. And next to the wine booth was a food booth were you could order freshly-made Flammkuchen, a pizza-kind of dish. We tried all 6 different wines and ate delicious, freshly-made Flammkuchen. Before lunch, we stopped at Weingut Klaus Zimmerling to taste the new vintage. Klaus Zimmerling, arguably the most famous winemaker in Sachsen, was away. We knew that this weekend he was not around. So we only scheduled a short tasting. We were well treated by one of his collaborators. In 1992, shortly after reunification, Klaus Zimmerling founded this winery. 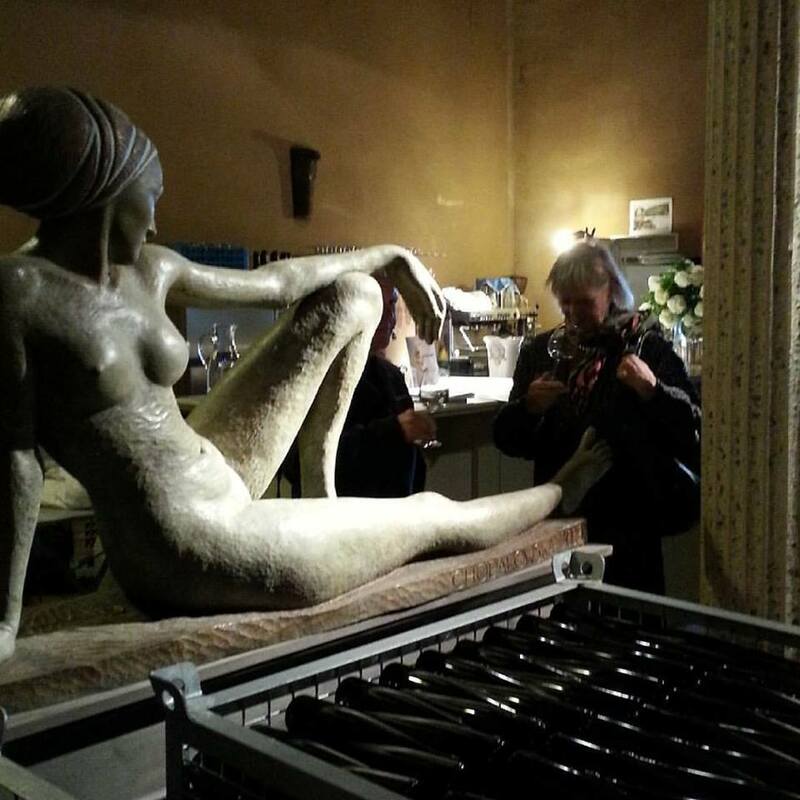 This is a very special place, hard to describe – you have to feel it - where art and wine is intimately intertwined. Two people, two passions, a heartwarming experience: Klaus Zimmerling, the grape whisperer, who sees his vineyard, the perfectly shaped, southern facing Rysselkuppe as a gift and natural wonder, which imposes on him the duty to go the extra mile to produce extraordinary wine; Malgorzata Chodakoska, his wife, who sculptures graceful feminine figures in her studio, which sits in the middle of the vines. Every year one of her sculptures will serve as model for the bottle label of that particular vintage. After lunch, we went back to Dresden and visited the Royal Palace. Dresden has a long history as the capital of the kingdom of Saxony. For centuries the Saxon royals spared no money and effort to furnish the city with artistic, and cultural splendor. The baroque and rococo city center, and wealth of art, gave the city the nickname: “Florence of the north”. In modern times, until 1933, when the Nazi regime came into power, Dresden was Europe’s capital of modern art. The allied bombings during the night of February 13, 1945 at the end of World War II wiped out the city. During GDR times very few of the most important historical monuments were restored. After reunification restauration efforts intensified, and major reconstruction projects, including rebuilding the “Frauenkirche”, were completed. The restoration of the Royal Palace is about to be completed. We visited the “Türckische Cammer” (Turkish Chamber). This is one of the oldest and most important collections of Ottoman art anywhere in the world outside Turkey. The largest object in the Türckische Cammer, which opened in 2010, is an Ottoman three-mast tent – a 20 m long, 8 m wide and 6 m high dream made of gold and silk. Only in Dresden is it possible for visitors to enter such a tent and examine the supreme craftsmanship of Ottoman textile artists at close quarters. We also visited the “Historisches Grünes Gewölbe” (Historic Green Vault), to get a glimpse into the late baroque world of the Saxon royals. The Green Vault was reopened on the ground floor in 2006. From 1723 to 1730, August the Strong had a series of rooms constructed to represent his wealth and power as an absolute monarch; the full, incredible experience of this late baroque synthesis of the arts is once again available to visitors in the original rooms. The day ended in a nice, cosy wine bar in the Dresden Neustadt.